"How to copy DVDs with Windows DVD Maker? I have 2 DVD burners in my system (one light-scribe), but lost the OEM burning software (Sonic) when we upgraded to Win 10, which was an HP XP Media Center. Will/can the Windows DVD maker burn/copy DVD to DVD? Thanks." "I'm really struggling to find a Windows DVD maker alternative to burn an AVI file to a DVD disc on Windows 10, like the one of Windows 7, so that I can play it in my DVD player. I really wished they kept the Windows DVD maker in Windows 10 but they have not. So I need to find a new program. The Windows DVD maker alternative has to be free as I have no money to spend. Anyone knows any DVD making programs I could use and if so link them to me." 1. Go to the Start Menu -> type in "Windows DVD maker" in the search box -> Click "Windows DVD maker" shortcut. 2. Add videos or photos by clicking "Add items" from the top menu to turn your favorite videos and digital photos to DVD. 3. Optional: you can customize the output DVD by changing the DVD menu, menu text, and menu buttons. 4. Click button "Burn" to start burning video files to DVD with Windows DVD maker. Note: Video file supported by Windows DVD maker includes videos in .asf, .avi, .dvr-ms, .m1v, .mp2, .mp2v, .mpe, .mpeg, .mpg, .mpv2, .wm, and .wmv. Windows DVD Maker is a DVD making app for Windows users, but available only on Windows Vista and Windows 7. Obviously there is no Windows DVD Maker for Windows 8 or Windows 10. So is there any way to sort that out? How to burn AVI MP4 video to DVD on Windows 8/10 without using Windows DVD Maker? Probably the best solution is to use a Windows DVD Maker Alternative - best free DVD burner for Windows , such as the freeware WinX DVD Author. Step 1: Download WinX DVD Author and get it installed on your PC (fully compatible with Windows 8). Step 2: Press icon "Video DVD Author" first and add video clips by clicking "+" button. You are free to create DVD menu, chapter menu, add background picture and music, etc. Step 3: Choose an output folder and format (NTSC/PAL). Then click "Start" button to burn videos to DVD using this free DVD Maker Alternative. >> How to Copy DVDs with Windows DVD Maker alternative. 1. OS: WinX DVD Author works great on Windows 98, NT, 2000, 2003, XP, Windows Vista/7/8/10 (32 & 64 bit) while Windows DVD Maker burns DVDs on Windows 7 and Vista. 2. The Windows DVD Maker alternative copy DVDs with videos in more input formats, such as MKV, MP4, MOD, FLV, RM , RMVB, Xivd, DviX, H264, 3GP, OGG, QT, VOB, etc. 3. You will be able to download and copy HD YouTube video to DVD at one go with Windows DVD Maker alternative. It is impossible to copy DVD to DVD with Windows DVD Maker, which is for burning video files to DVD for watching on computer/TV. 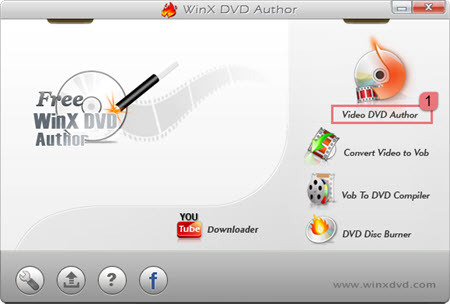 But a Windows DVD Maker alternative, like WinX DVD Copy Pro can help you with your DVD to DVD burning. WinX DVD Copy Pro comes highly recommended to you also because 1000 free copies are offered per day in a Halloween Giveaway. Grab the chance to give it a whirl. Step 1: Download WinX DVD Copy Pro on your PC, and open it up after installation. Step 2: Choose "Clone DVD to DVD" under the "Full DVD Disc Backup" option. Step 3: Import a DVD as the "Source DVD", and load a blank DVD disc in another drive as "Target DVD". Step 4: Click button "Run" to copy DVD to DVD using this Windows DVD Maker alternative.